Imagine driving down a four lane highway. In Boston, you’re on Route 495, in San Francisco, you’re on Highway 101. Now imagine you’re driving on the left. As the driver, you’re sitting on the right side of the car, the stick shift is on the left (automatic isn’t an option), and the fast lane is on the right. Now imagine pedestrians walking down the road. That’s right. There is no side walk, no place for walkers, but they are there. Walking. As cars whiz by. Oblivious. The women balance jugs on their heads. The men and boys carry sticks to herd along the cows, goats or sheep. That’s what we experienced as we drove over 2000 miles in South Africa. As we drove along the edge of a hill, we often saw people walking only a few feet from the road and from cars driving 120 kilometers an hour or more (that’s about 75 miles per hour). 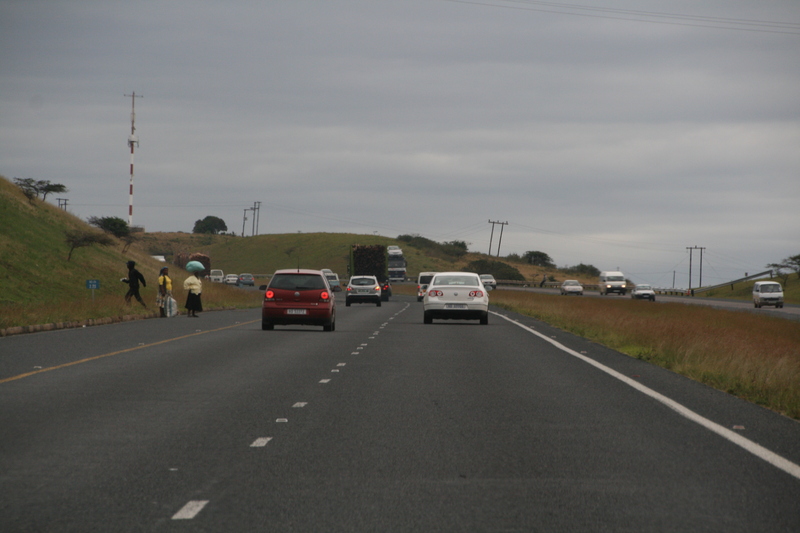 As we encountered “High Accident Zone” signs, cars and trucks appeared around curves, driving fast and inconsistently, swerving and passing when the road narrowed to one lane but the speed didn’t slow. When road signs warned of unfenced areas, we knew anything, people or animals, could meander into the road and cross our path without warning. But nothing slowed the traffic more than a heavy loaded truck, barely plugging along on the ungraded highway.